To state that Avatara (61'16") is "Experimental" is only half the story. While it is an album of sonic experiments, it is not just a random organization of sound. 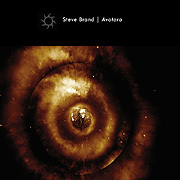 Ambient artist Steve Brand tells a story - although Avatara does bring more questions than answers. As it wanders the terrain of the possible this work asks you to adjust your sensitivity to music and its possible variations. Some of the pieces are controlled collisions of carefully rendered tones, while others breathe and expand beautifully across a brain-churning expanse of space. Opening with a curious metallic clamor Brand sets an unusual atmosphere. By continually introducing new timbres and captivating designs, across six tracks he sustains a striking sense of wonder. Moods range from dark and questioning to luminous and hopeful. Born of digital, this experience gets better with each pass. The mind seeks patterns, in the world and in music and art. Works like Avatara at first seem formless. But one must tolerate being lost to appreciate this music. Through active listening we find this work's structure and then its meaning - grasping the whole from the sum of its parts.